Not only did Rhapsody launch a DRM-free MP3 music store — see Steve O’Hear’s coverage today — but it also has engaged with Verizon Wireless to offer a new mobile subscription plan called VCAST Music with Rhapsody. 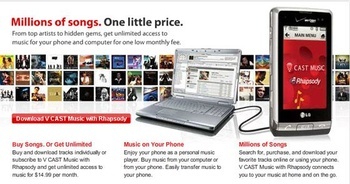 Verizon notes that, for the cost of a single CD, its wireless users can subscribe to VCAST Music with Rhapsody for $15 a month to gain unlimited access to Rhapsody’s five million songs. These songs will carry digital rights management to protect against copyright infringement and illegal file sharing. Users can authorize three PCs and three mobile phones for use with the service. However, Verizon subscribers also have the option to purchase music over-the-air for $1.99 a track, which includes a “complimentary” DRM-free master copy that users can download from their PCs via a VCAST Music with Rhapsody software program at a later time. This software is not available for the Mac. VCAST with Rhapsody works on VCAST-compatible phones such as the Motorola W755, the Samsung SCH-u550, Glyde, and Juke, and the LG Decoy and Dare. The service also will be available for the Chocolate 3 when it’s available, probably at the end of July. Rhapsody’s moves, and Verizon’s involvement, is not thought to be a full frontal assault on Apple and it’s market-leading iTunes Store, which also features desktop and OTA downloads. Rather, the executives say, they are embracing the success of Apple services and products and hoping to extend the digital music market.